Gov. 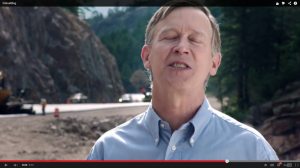 Hickenlooper has finally decided to stand up to President Obama and just say no to Gitmo. From where did his sudden courage come? The belief that Obama would never actually do it. Hickenlooper claims he’s standing his ground for the people of Fremont County, home of Obama’s seven proposed relocation sites. But Hick hasn’t bothered to actually visit there and speak to his constituents about it first hand, because it’s not Aspen. And do what, governor? Hold the cell doors open while the military marches the detainees inside? Taking action after the fact, after the barn door is opened and the detainees are leaving Gitmo, is too little to late. Way to be bold, Hick. Way to stand up for Colorado.